TITLE: Fifty Bucks to Trust you. to intimate you with this new development. I have a widow from Haiti recently transfered to our Camp. She lost her husband and three children during the recent trouble in Haiti.which is causing her lost of memory and constant high blood pressure.however she is presently recieving medical attention in our hospital. She told me in confidence that she came into South Africa with huge sum of money at the tune of Sixty Six Million U.S. Dollars($66million) concelled in a consignment which she deposited with a private Security Company in Pretoria for proper keep and safety and that she wants me to assist her to get a reliable and trusted foreign partner who will assist her transfer the huge sum into his or her foreign Bank account abroad for investment purposes. She told me that the money belongs to his Uncle who was at the head of the Haitians Army and who was killed also during the upheveal. I remain greatful to get in contact with you and will be pleased if you can grant me the opportunity to work out this transaction with you for this unfortunate widow.I have introgated the widow and have collected data that proved her very correct and sincere about the money, but it is very unfortunate that I cannot exhaust the true picture of this proposal through this writing because of its secret nature and therefore, I am of the opinion that for you to be well informed on this, we need to arrange for our person to person meeting in the near future immediately you indicate your willingness to assist and I am assuring you that we can trustfully and unitedly execute this transaction without risk through your cooperation to the benefit of both of us.we can arrange to meet in neutral country for obvious security reasons. I hope that our face to face meeting will surely enhance our relationship and will give us the opportunity to know exactly our percentages when the money is finally transfered.i also hope that you will consider my person and position and reply favourably through my personal e-mail address above for safety.pls i enjoin you to be mindful of our security in your subsequent communications. Chief of Operations: Fielding Medical Supplies Inc.
First a little information about myself and my company. My Name is Stuart Fielding and I have been working in this industry for eighteen years. My company is called Fielding Medical Supplies Incorporated and I am the Chief of Operations. My company specialises in manufacturing medical and food containers for use in third world famine and aid supplies. I own 5 manufacturing plants and we are one of the UK's largest suppliers of medical and food containment supplies. We supply equipment to places such as Kenya, Eastern Europe, the Far East including Malaysia, and several African countries. Presently our annual profits are around £8.4 million UK pounds per year, and I employ just over 400 employees. thank you very much for your email and the information about the security of passport and iD.i think it is very necessary for us to be very careful and mindful of our arrangement for security reasons. pls be informed that i am a very busy person due to the nature of my humanitarian work.i believe you are very suitable for this transaction because of your carefulness and seriousness about business.i have informed the widow about your interest to assist her in the propsition.i have also recommended to her that you are very suitable for the investment.she is very happy and grateful to you. i will contact the private security company where she deposited her money in pretoria to inform them to start the process to send the consignment to you as soon as possible.pls note that the widow informed me that she did not disclose the contents of the concelled consignment to the private company for odvious security reasons. Meanwhile,be informed that i will be very busy next week because all the directors of all the African Refugee Camps(ARC)will be having a very important meeting with the African leadres of NEPAD to discourse about matters affecting foreign refugees in Africa.i believe you can come up with a very good and convinient arrangement that will assist us to facilitate the transaction. pls i derserve my personal protection in this transaction to protect and preserve my image because of my position.i do not want any scandle we have to very carefull in our communications. How are you today?.i hope all is well. i hope you recieved my email i sent to you. After my email to you,i had a comprehensive discussion with the widow and it became necessary that you and i will meet face to face inorder to conclude this transaction urgently,due to the health condition of the woman that prompted her to instruct me to contact you,so that we can conclude the transaction as soon as possible. Obviously,i will like to meet you in Holland because i have the visa already to travel to holland. I know that you are a very busy person,but pls for the urgency need in this transaction,can you make out a date next week and advice me on the date so that i will be prepared to travel to meet with you on that date. Pls it is necessary you sugest a password to enable us identify ourselves when we meet in holland. I and the widow extends our appreciation to you on your willingness to help. Many thanks for your email and your explanation of the facts, however your request for me to fly to Holland is not one that I am yet prepared to accept. You see, to fly to Holland will cost me around $600 in ticket fees, and this will require a lot of TRUST on my part. Not only will I have to spend hundreds of dollars for my plane tickets, but I will also have to spend some time away from my very important business. Now, I will need for you to explain to me in detail what is the point in me flying to Holland? What is it that cannot be discussed via email? Thank you very much for your prompt reply to my email. The importance of both of us to meet in holland as i sugested will strenghten the TRUST betwwen us,since the transaction we are embarking on is too great to be dealing only on email,in that seeing ourselves face to face will be of a great benefit for us to built TRUST,because most questions both of us might care about will be answered face to face. I am giving you 100% assurance on this transaction,so do not worry about the expences you are going to encure travelling to holland and the time you are going to stay away from your business,because the transaction you are coming to holland worths it a lot. in my first email to you. Thank you once again for your email. My apologies for the delay in replying to you but I have been in important board meetings all day. 1. How long will this process take from start to finish? 2. Will there be fees incurred, and if so I will need to know the FULL and COMPLETE total. I know that such large money transfer may require quite large fees, but I MUST know the full extent of these fees. 3. What GUARANTEE and PROOF can you offer me of the true existence of this money? (1)The process will not take more than 2 to 3 days. (2)Yes there will be fees incurred,for instance your travelling,hotel and any other logistic expences that might incure in the process of the transaction. as you know this transaction is a great transaction that has to be handled with very care and confidential.as i earlier told you in my first email to you,i can not exhaust the true picture of this transaction to you only through email that is why it is imperative that we must meet face to face in holland. i await for your immediate reply. Thanks for your email, but I am afraid item #3 does not inspire me. All you are telling me are words, you offer no proof of the existence of this fund, and again, I am not going to spend hundreds of dollars of my own money to fly to Holland without hard evidence that this fund really exists. However, having said that, I will make an offer to you which if you agree to will convince me to come to Holland to meet with you. That you agree to send me, by courier, $50 (fifty dollars) in *cash* to my private home address. This will show me exactly how much TRUST and CONFIDENCE you have in this business deal. 1. That I WILL fly to meet with you in Holland. 2. That I will promise help you financially to complete this deal if needed. As an experienced and wealthy businessman, I do of course realise that the transfer of such large amounts of money will probably require some kind of processing fees. If you send me the $50 then I am willing to fund this transfer to the maximum amount of $25,000 (twenty five thousand dollars) on the condition that I can deduct this amount from the fees after the fund has been transferred into my account. This is my final offer. If you are unwilling to proceed with my terms them with respect I advise you to find another partner. Subject: I am waitng to hear from you. How are you today.i hope all is well with you.i sent email to you but i have not recieved a reply from you.i hope you recieved my last email. Further to my last email to you,pls note that all the necessary little expences we will incure in the transaction will be collected back from the money as soon as the money is in your possession.This fact i have reolved with the widow after our intensive discussion,because she already deposited the money in the private security company,so i feel it is very important for me to inform you about my last meeting with the widow. The window expalined everything about the money to me so there is no problem.the money is intact in the private security company in pretoria. I am waiting to hear from you to enable me start my arrangement to travel to holland to meet with you and finalize the transaction. thank you very much.everything is ok .i am in control.Remain blessed. 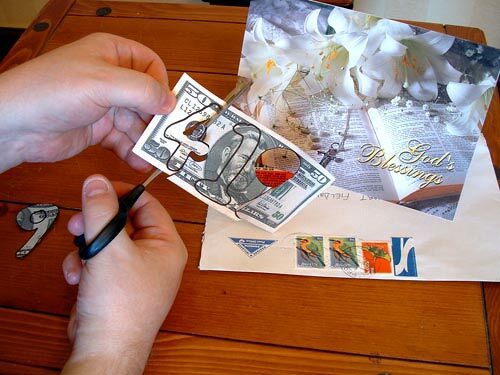 I accept your offer to send the sum of $50 dollars cash to your private home address through courier service as you requested,but that will depend if the courier service can accept to carry the cash,so please send to me by email your private home address,so that i can do that immediately. I also appreciate your promise to help financially in completing this transaction if the need arises.Considering the urgency and importance needed to conclude this transaction as soon as possible,i have already started making a very concrete and safe arrangement through some diplomatic connections i have due to my humanitarian official position to carry the consignment from the private security company in pretoria to holland in a secured diplomatic process.This idea is to help both of us to determine together face to face on how to invest the money profitably through your wide and wealthy business experience advice. I will like to know if my diplomatic arrangement as i stated above will be ok with you,so that i can conclude the arrangement immediately. Please Advice. NOTE;please you should keep this transaction and the diplomatic arrangement confidential. My thanks for your positive reply. 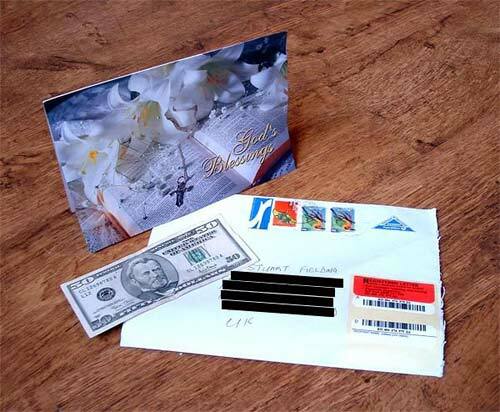 There is no need to tell the courier that you have enclosed money in the package. 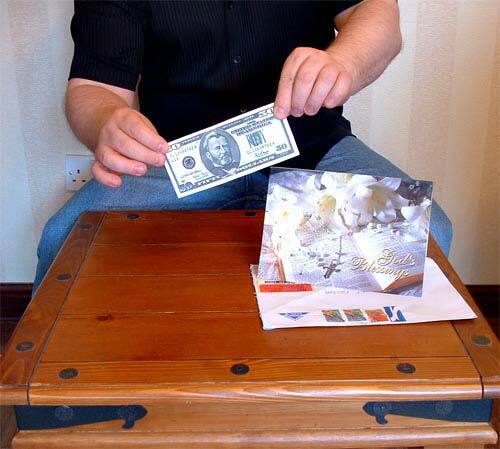 Just put the $50 into a birthday card, that will make it impossible to detect the contents. I have many times previously send cash overseas this way and I have never encountered a problem. Your arrangement are fully compatible with me, and on the condition that I do receive the $50 token of trust then I am happy to agree with your arrangements. I must stress that my agreement to proceed in this deal is based ONLY on the condition that you are able to send the $50 (which as I have told you will be refunded to you upon my arrival in Holland). Please take careful note that the future of this deal rests solely on your ability to send the $50 to me. I want the money sent to my private address because I need to keep this deal secret from my other business dealing. As you have said, it is very important to keep this deal as secret as possible. Once you have sent the $50, please inform me of the courier tracking details. I could not reply you promptly due to official engagement that took me out of my station.However,i will be sending the $50 dollars tomorrow by courier service to your private home address as you stated,and i will inform you of the courier tracking details. Thank you very much for your understanding and God Bless you. Thank you for your prompt and professional reply. You have given me great confidence in your ability to handle this deal. Please do send me the tracking details as soon as you have them. I will contact you by telephone immediately that your parcel arrives. I got your email,thanks alot. I have sent the parcel via Registered Postal Services to your attention,the tracking Number is RD48447xxxxZA.It may take 4 to 5 working days to arrive,but you can track it with the above stated tracking Number. Please email to me your confidential telephone number so that I can talk with you as well. My thanks for your confirmation. Is Registered Postal Services the name of courier company? If not, please could you tell me the courier company name? Thank you for your email.I sent you the Registered parcel through the South African Postal Service (Post Office). As i told you i am still making the secured Diplomatic arrangement to deliver the consignment from pretoria to holland for us,and the arrangement is moving sucessfully.The conclusion will depend on the agreed date both of us will arrive in holland.So please advice me on your travel arrangement to enable me arrange for mine. I am disturbed that the payment still has not arrived. Please will you confirm the address that you sent the parcel to? Subject: I am still waiting for your Advice. Please do not be disturbed that the payment has not arrived,it must arrive within this week,as I ascertained from the Post Office here. I sent the Parcel to your private house address as you instructed. Subject: Have you recieved the Parcel?. How are you today.Have you rceieved the parcel?.I think the parcel will be within your region by now.Please could you track the parcel with the tracking information I sent to you. I will be waiting for your Advice. I am happy to report that at last your parcel was received, thank you. I am pleased that we have now come to a positive point in our relationship, and I am now ready to progress and move on with this deal. Please instruct me how you wish to continue. I am very glad to hear that my parcel was recieved safe and intact,and I am also pleased that you are now ready to progress and move on with the transaction.Thank you very much. As i earlier informed you about the solid confidential arrangement i was making inorder to carry the consignment through Diplomatic process to holland,I was able to conclude the arrangement in a very positive condition. The Diplomatic contact agreed to carry the concelled consignment for us on the cost of($35,500.00)with full Diplomatic Immunity Protection without any checking on arrival and further destination. The modality of payment for the service is($5,000.00)part payment here in south Africa,and the remaining balance of($30,500.00)will be paid to them cash in holland after sucessful delivery of the consignment to us. Due to the urgency of this transaction,it is important that we conclude the actual date of our arrival at holland next week as soon as possible,so please Advice me immediately on the convinient date of your arrival to enable me schdule for mine and conclude with the Diplomatic contact as well. Importantly.I will like you to give me your confidential telephone number I can use to contact you immediately on my arrival in holland. I have informed the widow about the progress and she is very happy and greatful to you. Thank you very much and God Bless you.I am waiting for your Advice. Please can you tell me the exact amount that I may be required to bring with me to Holland, and also, what date would be most beneficial for me to fly out to Holland for the meeting? I will be able to source for($5,000.00)us dollars and pay to the Diplomatic contact here in south Africa as part payment for them to commence the progress. Please Mr.Fielding,you will be required to bring the remaining balance of($30,500.00)dollars cash inorder to pay off the Diplomatic contact on sucessful delivery of the concelled consignment to us in holland. I will conclude my travel arrangement with the travel agent by monday and also finalize with the Diplomatic contact as well,then I will advice you of the actual date this week you will fly to holland. I await for your reply. Thank you very much and Remain Blessed. I am sorry, but $30,500.00 dollars is not an amount I am willing to pay, I already told you that the maximum amount that I would be willing to fund this deal to was $25,000 as discussed in my email to you of May 9th. Considering the urgency needed to move forward in this transaction,I have therefore sucessfully completed all logistics and other necessary arrangements with the Diplomatic Contact to move with the concelled consignment inorder to arrive holland by Friday the 3rd of June 2004. So it is very very important that you make your travel arrangement to arrive holland by Friday Morning. Dear Mr Fielding I will be sending my Confident and Trusted Brother to holland inorder to meet with you and collect the consignment from the Diplomatic Contact on their arrival,since it is IMPERATIVE that the Diplomatic People MUST leave OFFICIALLY on Thursday night to holland. It became necessary that I must send my TRUSTED Brother to holland to represent me in recieving the consignment from the Diplomatic contact.This is because there is outbreak of Epidemics that started on Sunday evening in the refugee camp where I am the Chief Incharge which have already claimed the live of four(4)Inmates(People),which attracted the attention of the government that necesitated the Official visit of the Secretary of Health and the Vice President of my country to visit the Refugee camp on Tuesday the 8th of June 2004. So please I will be joining you and my brother immediately after their Official visit to the camp on Tuesday,since I must be present here to prepare Officially to recieve them. Please Fielding,it will be necessary for you to give me a confidential telephone number where I can talk to you while you are in holland with my brother to discuss the progress of the transaction immediately the consignment is collected from the Diplomatic Contact by my brother. Dear Mr Fielding be rest assured that my brother will handle everything OK on my behalf before my arrival. Please remember to be keeping record of all your expences you will be incurring in this transaction because I am also keeping record of mine which has to be collected back after the transaction. I await for your urgent reply. Thanks for your understanding and Remain Blessed. My money is held in a high yield, high interest account, and if I draw on the account early I am charged an early withdrawal fee. To withdraw $30,500 (Thirty thousand, five hundred dollars) will cost me $185 (one hundred and eighty five dollars). Now, I am willing to pay you the $30,500 IN CASH on the understanding that you agree to send me the $185 early withdrawal fee. If you do not agree to send me the $185 fee then I will only be able to offer you $25,000. Anyway, the choice is entirely yours, I can send you $25,000 or $30,500 if you pay my fee in cash via courier. Those are the only dates that I can be free to fly to Holland with the payment. I hope one of those dates is agreeable to you. If not, then we will have to wait until the middle of July before I can fly out again. Subject: Re: VERY VERY URGENT. I got your Email and was very very disappointed that after all the crucial arrangememt I have already concluded with the Diplomatic Contact to see that the concelled consignment leaves for holland today through their official diplomatic protocol movement on the bases that you and me are working as partners in progress and suppose to have confidence and trust to each other. I am also surprise that you are still feeling that you have a vase responsibility that is not being met by any of the parties knowing fully well that I personally have strong confidence to entrust such a huge amount of money into your custody without having doubts whatsoever,your approach now is giving me a great concern on the progress of this transaction since I have given the widow every assurance about your irrevocable promise to assist in getting this transaction through. that is beneficial for us and the consignment to arrive holland,which you replied back to me through your email stating that you will assist and that I should arrange a date that is beneficial for the process,which I did,only to be getting disappointment now from you which is very dangerous to the transaction. Honestly, it is going to be detremental if the consignment did not leave for holland today night as scheduled with the diplomatic contact,so your immediate consideration to assist is needed to be stipulated to me by email in time urgently today for me to know how to handle the disappointing and trouble situation. Your sugestive travelling dates are totally uncalled for at this crucial time since every arrangement has already been scheduled to take effect from today and tomorrow as stated in my previous emails to you which you are fully away of. 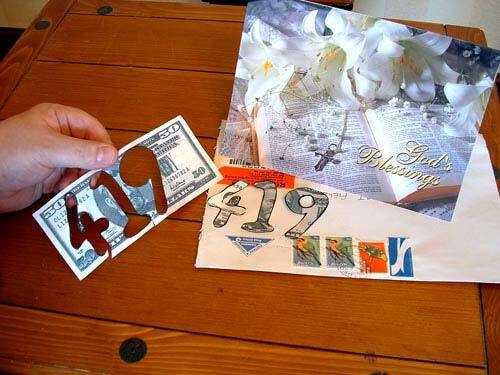 Please confirm to me your full mailing address and I shall return the $50 you sent to me. I am willing to give you the $30,000 for a small amount of help at your end, but it seems you do not think this deal is important enough to warrant helping with such a tiny amount. It is obvious we are getting nowhere here, so I will return the $50 to you and we shall call this deal to and end. Subject: I am very very disappointed. I am very sorry for the delay in my reply. Honestly,I was busy making arrangment to stop the lifting of the consignment by the diplomatic contact. At this stage I am confused and disturbed about the next step to follow because of this your suicidal disappointment.However,I am making a better arrangment to find another contact who can assist me in the transaction since you have decline to assist me with $25,000.00 dollars only. I am very very disappointed about this your last minute action. 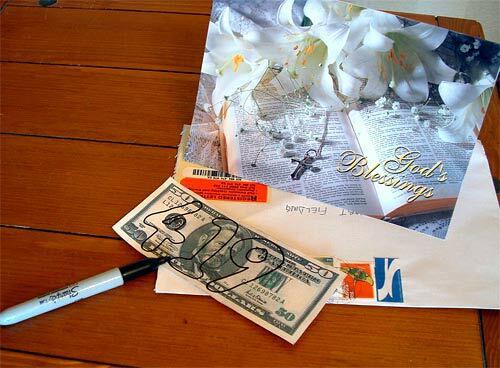 For the second time, please will you confirm you full mailing address so that I can return the $50 to you? I am a very honest man, and because this deal is over I do not want you to lose your $50, so please let me return it to you. For some reason you seem to be ignoring my emails, so I will make this the last one I send to you. I have asked you on three separate occasions to supply me with your full mailing address so that I can send the $50 back to you, but for some reason you have seen fit not to reply. It is not right for me to keep the money, but you are not enabling me to return it, therefore if you have not given me the information I require by Tuesday June 22nd I will donate the $50 to a local children's charity. First I must apologise for my extremely late reply to your email below. I am afraid that at the time you sent me your message I was out of the country and so did not read your email until I returned this evening. Please let me know if you still require my help in your proposition. Thank you very much for your email. Actually,I became very worried when i did not hear from you. However,after discussing with the widow about your email,she said that there is no problem,so we can start the arrangement immediately. I hope you had a very nice trip.You are welcome back.For the urgency and the importance involved in this transaction,it will be necessary we proceed on our arrangement to meet face to face so that we can conclude the transaction. I am waiting to hear from you to enable me tell you the next step. I am sorry, but due to a very urgent business commitment I have to fly to Argentina tomorrow morning and I will be away for approximately 6 months. If you still need my help when I return I will try to help you. I will contact you immediately that I return home in December. Just to let you know that as you did not reply to me I have donated the money you sent to St. Patrick's Chilterns Foundation here in London. It has been some time since you contacted me, so I guess you have given up on ever seeing your $50 again. Well, it's time to let you into a little secret. YOU HAVE BEEN SCAMMED! You see, my name is not really Stuart Fielding. I am not a businessman at all. From the very first email you sent me I knew that you were a 419 scammer, a liar and of course a common thief. There is no widow, and there is no $66 million dollars. I have been wasting your time and resources making you think you were going to get a big payment from a stupid rich businessman when in fact I am the one who has scammed YOU! Just think how dumb you are going to look when your friend and colleagues read all about how such and idiot like you send ME a payment of FIFTY DOLLARS. What a STUPID thing to do. You can't be much of a good scammer if you keep sending your victims money can you?! Of course, I will not want to keep your filthy stolen money, so I decided to let you see what I have done with it. I hope you enjoy the photographs.